The vee-shaped head of Taurus, the Bull, dominated by the reddish star Aldebaran, is to the right of center with Hyadum I (Gamma) at its point. Theta, which consists of Theta-1 on top, Theta-2 on the bottom (note the elongation of the image), sits between Aldebaran and Gamma. Taurus's northern horn, represented by Elnath, lies at center left, Zeta toward lower left, down and to the left of the bright body, which is Saturn, which was moving through Taurus when the picture was taken. The head of Taurus is a star cluster called the Hyades (150 light years away), of which Alebaran is not a member. At the top is a more famed cluster, the more-distant Pleiades, "Seven Sisters," its brightest star Alcyone. Ain (Epsilon) is just above Aldebaran, while Lambda Tauri is the brightest star to the right of the end of the Hyades. A line continued from the Hyades through Lambda points at 30 Tau. 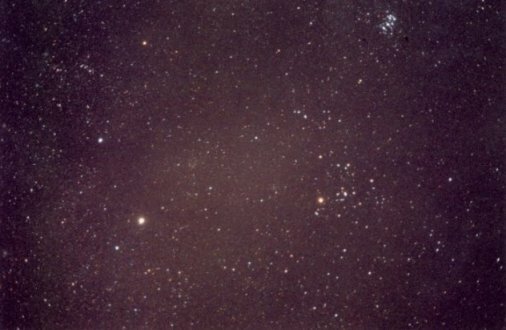 Within the upper part of the Hyades' "vee" is a triplet of stars, from right to left Delta-1 (Hayadum II), Delta-2, and Delta-3. Kappa is the brighest of the triplet up and to the left of Ain. 119=CE Tau lies within the set of fainter stars below Saturn. Xi and Omicron Tauri lie off the picture to the right, appearing just east of the head of Cetus. Tau Tauri lies up and to the left of Ain roughly a third of the way to Elnath. Look for 37 Tau halfway between the Pleiades and Hyades, with 39 Tau just barely separated from it down and to the left. Nu Tauri lies near the lower right edge, while Mu is the lower of the pair to the left and a bit up from it. Southern Auriga lies toward upper left. Chi-1 and Chi-2 Orionis are the upper stars of the twin pairs near the lower left corner and are seen on the image of Gemini as well. U Ori is barely visible just down and to the left of Chi-1 Ori. Omicron-1 Ori lies down and to the left of Aldebaran about half way to the edge of the picture. The Galaxy's anticenter (the point opposite the Galactic center in Sagittarius) is at center left just over the border of Auriga, while the Summer Solstice lies toward the lower left corner above Chi-2 Ori. 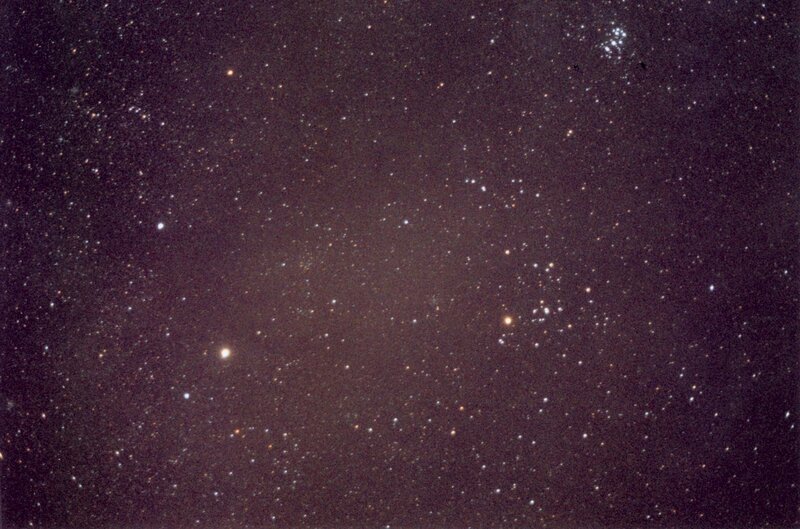 The open cluster M35 in Gemini hovers at the lower left edge to the left of the Solstice. See Taurus's clusters and variable stars at the Galaxy's Anticenter. See Taurus from Bayer's Uranometria of 1603 and from Flamsteed's Atlas Coelestis Edition of 1721. For more on Taurus, see The Admirable Bull at Stellar Stories.